Sometimes when you are in a hurry and a little stressed, you think of ways to cut corners just to save a little time. 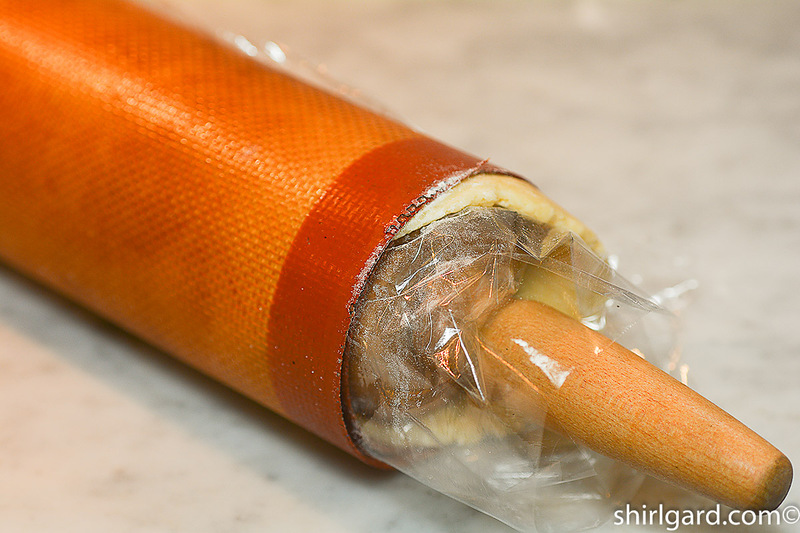 This was my frame of mind when, without really thinking about it too much, I put a disk of soft freshly-made pie dough on a Silpat mat, covered it with a sheet of plastic wrap, rolled out the dough quickly, rolled the whole thing up on the rolling pin and stuck it in the refrigerator. I let it chill out for about two hours before continuing. I am not a big fan of cutting corners if it is going to hurt the quality of a product, but this little short cut worked and I’ve used it many times since. You may like it too; I call it Pie Dough Express. 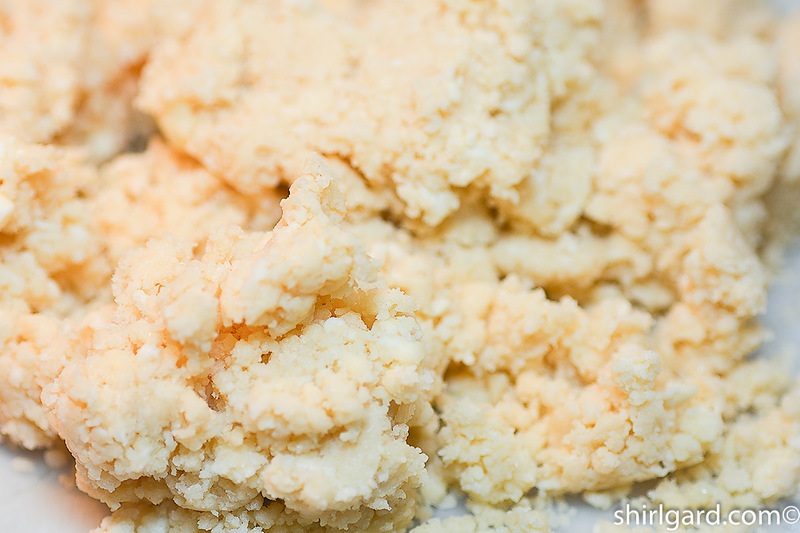 Use food processor method with cold butter & shortening. 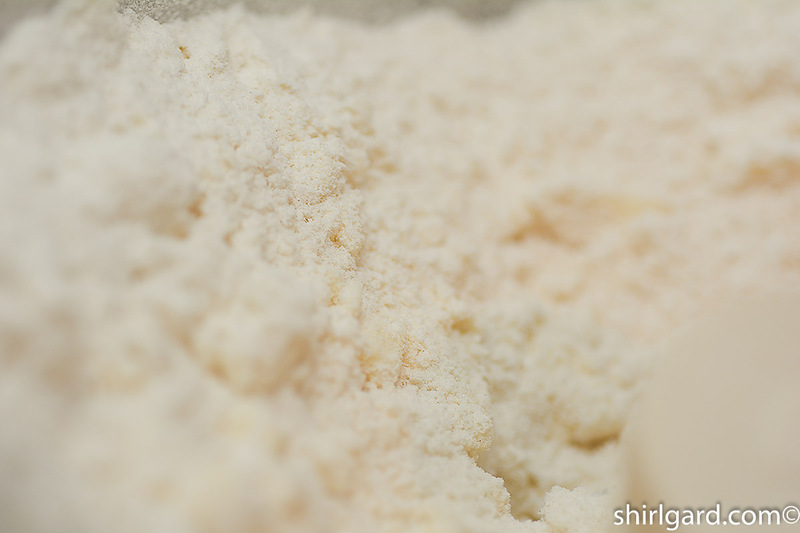 Pulse the cold fat into the flour until you have an uneven mixture of small lumps of flour-covered fat. Process only until the dough barely comes together. 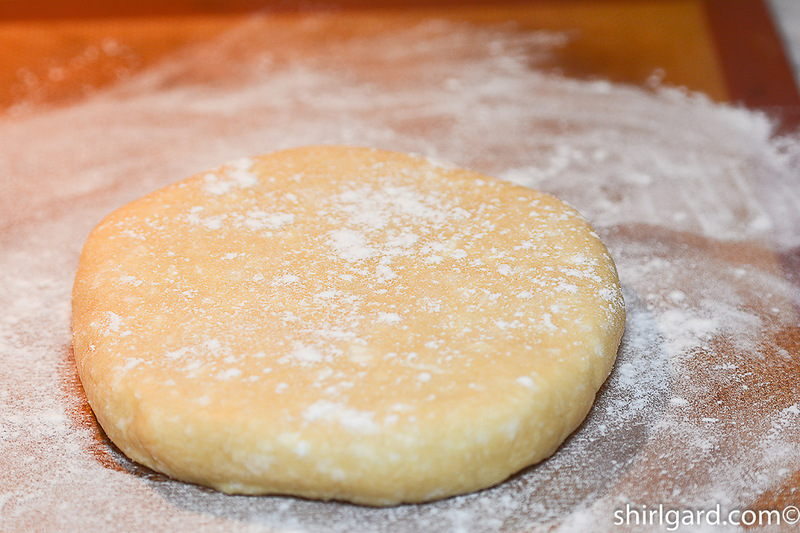 Press dough into an even round and place on a Silpat mat dusted with flour. 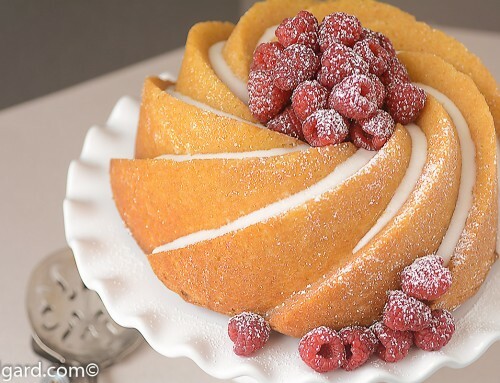 Roll up the whole thing on your rolling pin. Pie Dough Express. Ready to refrigerate. 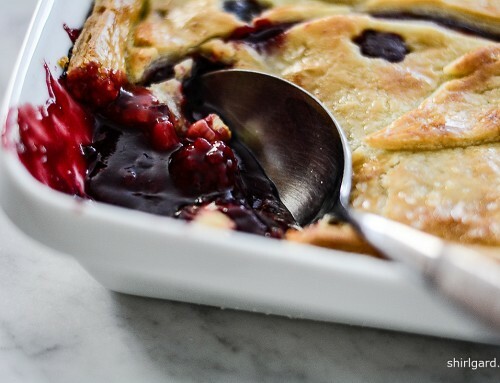 This recipe uses a short-cut method of rolling out freshly-made soft pie dough on a Silpat mat, rolling it up on a rolling pin and refrigerating it. I like this technique because it is quick. You may like it too; I call it Pie Dough Express. 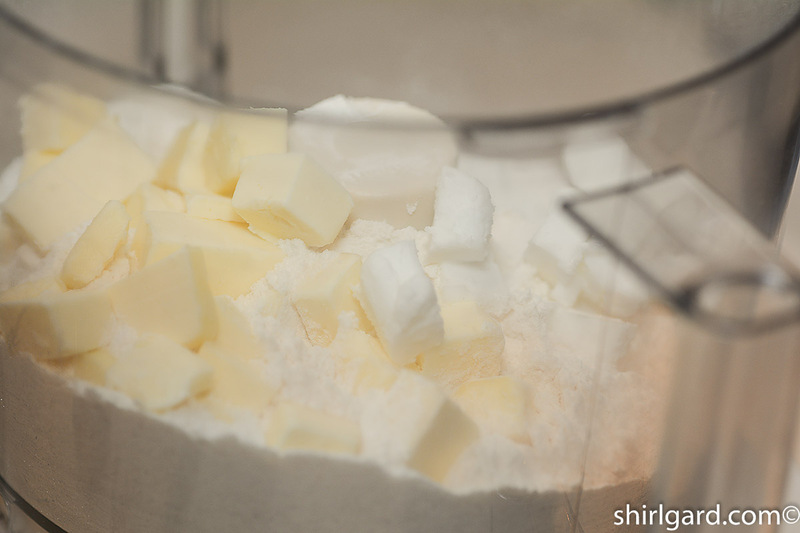 FOOD PROCESSOR METHOD FOR MIXING: SCALE out flour, sugar, and salt. Transfer to food processor bowl. 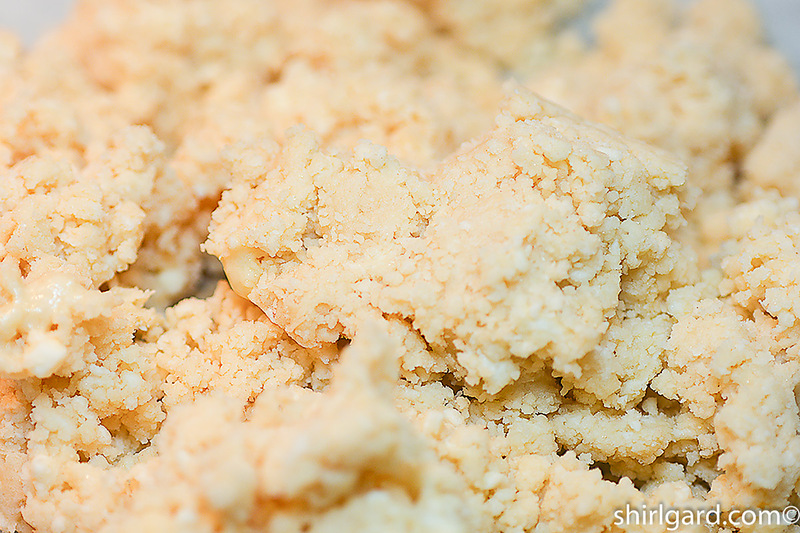 SCATTER cold butter cubes over the flour mixture and add chunks of cold shortening. Pulse until mixture is crumbly; an uneven mixture of small lumps of flour-covered fat. WHISK ice water, cold egg, and vinegar together and pour over flour mixture. DO NOT combine liquids until ready to add to food processor. PULSE just until the dough comes together in a soft mass of dough. 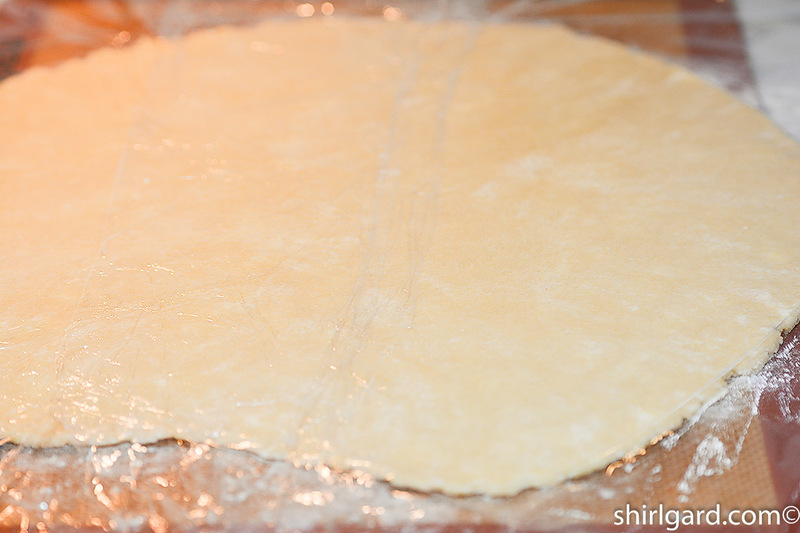 TRANSFER dough to a lightly-floured Silpat mat and press together into a flat disk about 1" thick. 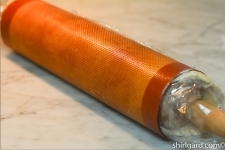 EXPRESS METHOD FOR ROLLING OUT DOUGH: PLACE the disk of soft dough on a lightly floured half-sheet Silpat mat, cover with a sheet of plastic wrap, and roll out about ⅛" thick to a diameter of 13". 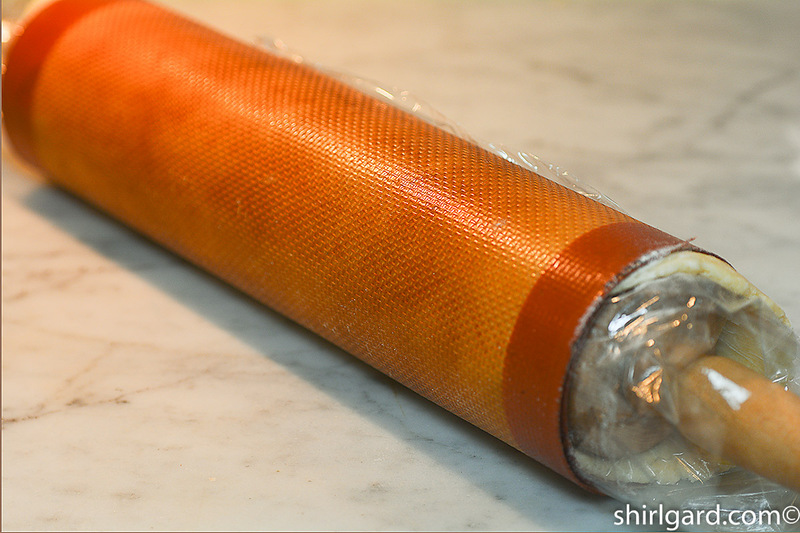 ROLL UP the dough on a rolling pin, still on the Silpat mat, and refrigerate the whole thing for about two hours. 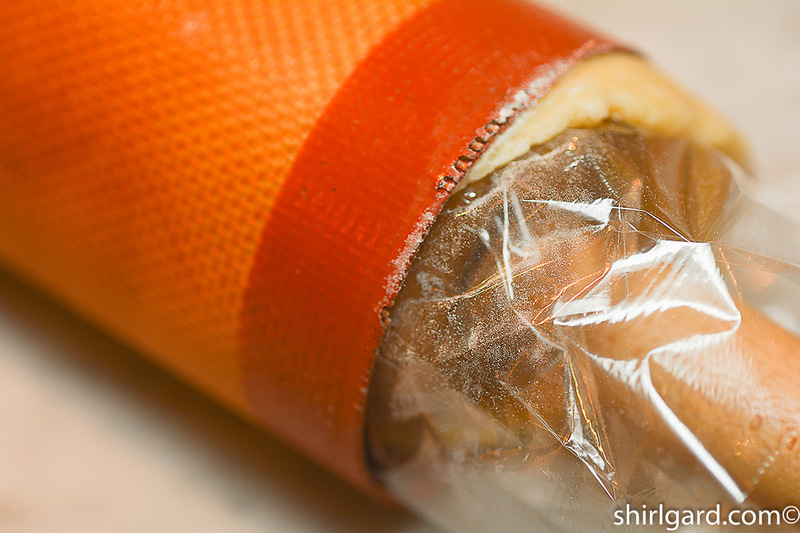 PEEL off the Silpat mat, leaving the plastic wrap intact on the other side. 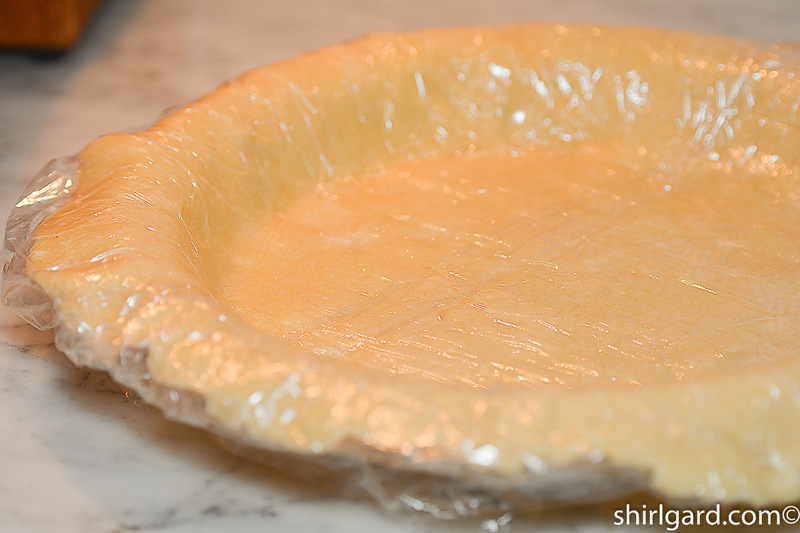 FILL pie plate with dough, plastic wrap on top, easing into the corners. FINISH according to your recipe. IF CRIMPING the edges, gently fold under the overhang all the way around. Chill completely before crimping, then chill or freeze the crimped shell before baking. 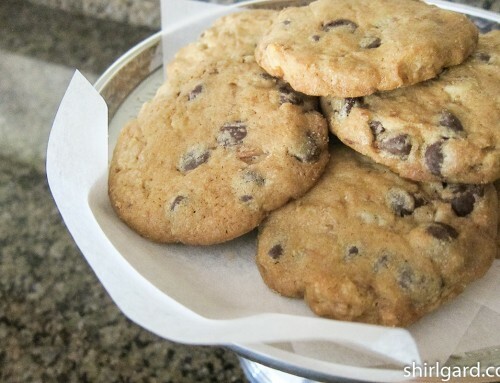 Working with cold dough helps maintain the shape while baking. 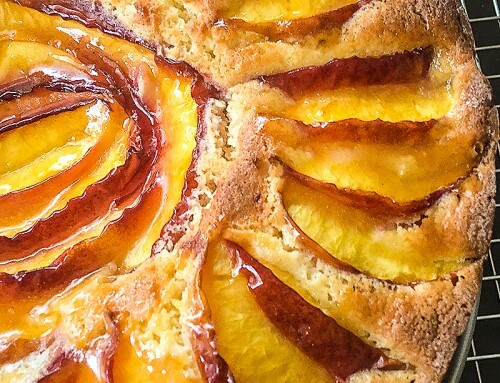 Recipe developed by Shirl Gard, using a combination of traditional pie dough ingredients with the addition of a little egg yolk and sugar borrowed from a sweet tart dough recipe. 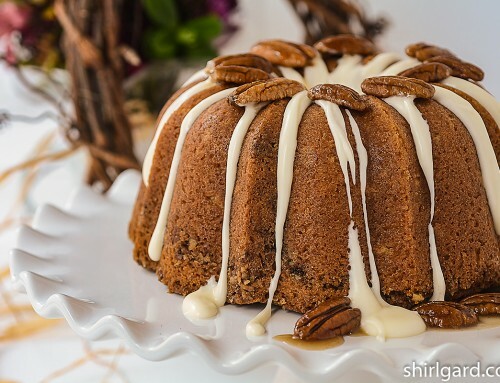 A touch of baking powder adds a little lift. I discovered the technique of rolling up the dough on a rolling pin to chill it quite by accident; I have used it many times since.